Martwayne | Power Through Fashion: Want to cut your production time in half? Then ditch the paper and pencils and go digital! Want to cut your production time in half? Then ditch the paper and pencils and go digital! This picture made me laugh when I saw it! But yes! We tailors now use laptops! :-D I spoke about it on our radio show on 98.9 Kiss FM on Friday and you should watch it! I tell you this is the way to go! Ok... so I realized that whilst promoting this Course (and I must confess, I don't think I really promoted it that much), I never really spoke about the benefits of the Course. So you are probably thinking... "why go digital when I can use my pencil and paper" right? You make clothes for people and draft your patterns manually. Imagine if you could do this on the system just once! And next time someone else comes, you input their measurements and voila, the pattern comes out in their own size! OR you run an in-house clothing production unit creating clothes in standard sizes. Oh... imagine the torture of having to grade each pattern one by one when with just a few strokes, your work is done! And this is just a SNAP SHOT of what this course has to offer! You can work across international boundaries as well. I have 2 people who have reached out to me asking me to create patterns for them. So this is you starting a new career as a pattern maker! Okies so ditch the pencils and paper and switch to digital patterns on your laptop! And save yourself the headache and backache as well! Register for our Pattern-Making & Grading with Computer-Aided Design. SO details about the Course?! I'll give it to you just now! Part 1 is the Pattern Making bit. It lasts for 5 weeks and costs N80,000 including your training materials except, of course, your laptop. That you need to come with. Part 2 is the Pattern Grading bit which is where you increase or reduce in size. This will last an extra 3 weeks and costs N40,000 if you registered for Part 1. If you want just this part of the Course, it will cost N50,000 and it includes your training materials. But to be honest, this limits you to just the manual grading portion because we can't start teaching you about the digital workspace in Part 1. Please bring your laptop. Oh... if you use a Mac please contact us before you register. And that's it really! Easy peasy! Trust me you will love this Course! Oh. PS. 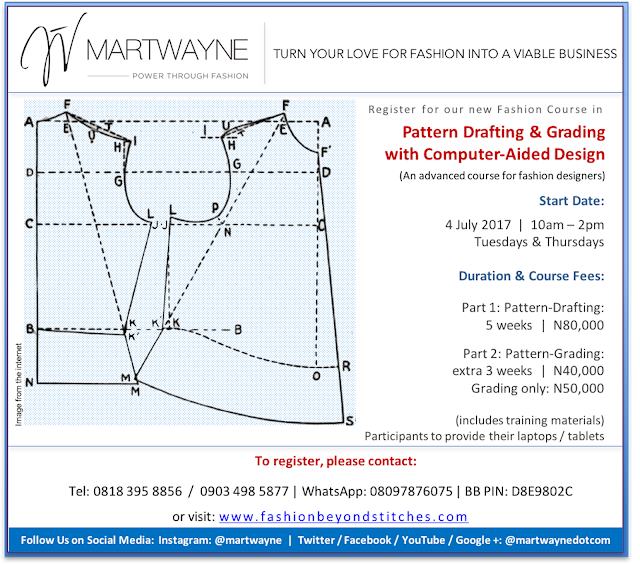 You need to be familiar with Pattern-making to register for this Course. If you are a beginner, you can register for any of our sewing courses. They all include pattern making. Fabulous! Please tell everyone to tell everyone!